Mindfulness is making inroads into classrooms, as teachers seek ways to center and focus their own attention as well as that of their distracted students. Trish Broderick describes the particular relevance of mindfulness to the teaching of adolescent students, including its potential to alleviate stress, foster motivation, engagement, and compassion—and ultimately, to improve both learning and social relationships. Her book is a guide to applying mindfulness to day-to-day classroom challenges; every chapter contains authentic vignettes of secondary teachers and students, brief practices to try, and a set of takeaway points and reflection questions. 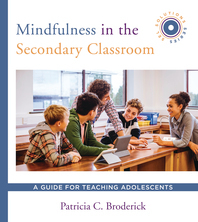 “Trish Broderick’s book hits the mark when it comes to teaching and learning about mindfulness in a high school setting. As an administrator, I have seen first-hand the positive effects of meditation and mindfulness classes on stressed-out students in New York’s urban high schools.” — Scott Silverman LMHC, Ed.D, Licensed Psychotherapist, Melville, N.Y., Assistant Principal, John Adams High School, Queens, N.Y.